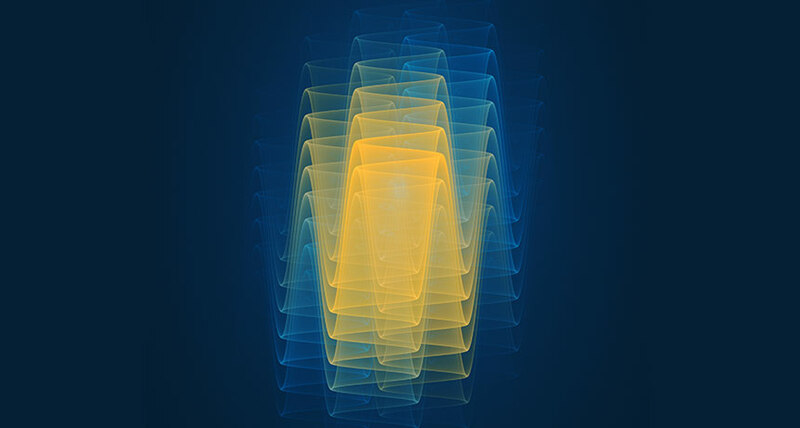 QUANTUM MECHANICS This artist's conception symbolizes the quantum wave function, the key mathematical expression for describing physical systems with quantum mechanics. Interpreting the meaning of quantum mechanics has a long and contentious history, as discussed in two new books: Beyond Weird by Philip Ball and What is Real? by Adam Becker. Quantum physics has earned a reputation as a realm of science beyond human comprehension. It describes a microworld of perplexing, paradoxical phenomena. Its equations imply a multiplicity of possible realities; an observation seems to select one of those possibilities for accessibility to human perception. The rest either disappear, remain hidden or weren't really there to begin with. Which of those explanations pertains is debated by competing interpretations of the quantum math, pursued in a field of study known as quantum foundations. Numerous quantum interpretations have been proposed - and an even greater number of books have been written about them. Two of the latest such books offer very different perspectives. Philip Ball, in Beyond Weird, argues that much of the famous quantum weirdness lies in the popular descriptions of it, rather than in the math itself. Adam Becker's What is Real? insists that the traditional "Copenhagen interpretation" is misguided; he extols the work of several physicists who reject it. Becker writes with exuberance and self-assuredness, often focusing on the personal stories of the scientists he discusses. Ball's approach is less personal but more conversational, although he does not try to evade the sticky technicalities that illustrate and partially explain the quantum mysteries. Bohr's lack of clarity has led to many misinterpretations of what he meant, and it is those misinterpretations that Becker criticizes, rather than Bohr's actual views. Becker's main argument insists that the Copenhagen interpretation embraces the philosophy known as positivism (roughly, nothing unobservable is real, and sensory perceptions are the realities on which science should be based), and then demonstrates positivism's fallacies. He does a fine job of demolishing positivism. Unfortunately, the Copenhagen interpretation is not positivistic, as its advocates have often pointed out. Bohr's colleague Werner Heisenberg said so quite clearly: "The Copenhagen interpretation of quantum theory is in no way positivistic," he wrote. And the philosopher Henry Folse's 1985 book on Bohr's philosophy thoroughly dispelled the mistaken belief that Bohr's view was positivistic or opposed to the existence of an underlying reality. Becker's book commits many other more specific errors. He says Heisenberg found his famous uncertainty principle "buried in the mathematics of [Erwin] Schrodinger's wave mechanics." But Heisenberg despised wave mechanics and did his work on uncertainty wholly within his own matrix mechanics. Becker claims that physicists Murray Gell-Mann and James Hartle "had long been convinced that the Copenhagen interpretation had to be wrong." But Gell-Mann and Hartle are on record stating that the Copenhagen view is not wrong, merely limited to special cases and not general enough to tell the whole quantum story. Becker's book does offer engaging discussions of the physicists who have questioned Bohr's ideas and proposed alternate ways of interpreting quantum physics. But he allows the opponents to frame Bohr's position rather than devoting any effort of his own to examining the subtlety and depth of Bohr's philosophy and arguments. And Becker fails to address the important point that every quantum experiment's results, no matter how bizarre, are precisely what Bohr would have expected them to be. Becker does not engage deeply with the more recent body of work on quantum foundations, an area where Ball excels. Ball especially favors the perspective on quantum physics offered by the notion of quantum decoherence. Very roughly, the decoherence process dissipates various possible quantum realities into the environment, and only those versions of reality that are robustly recorded in the environment present themselves to observers. It's of course much more complicated than that, and Ball admirably conveys those complications even at the occasional expense of clarity. Which puts his account closer to the truth.